PBX (Private Branch Exchanges) are used by companies to route telephone calls within their own premises. Depending on the type of PBX used people in your organization can have their own extensions, place calls and even send SMS messages and faxes. Setting up your own PBX has traditionally been time consuming and costly. These days however, there are a number of companies offering phone systems in the cloud. In this guide, you’ll discover some of the top cloud-based companies offering this service today. All of these providers will save you the trouble and expense of installing your own hardware, although some are compatible with existing PBX systems too. As their systems are based online, many of these providers also support video and VoIP calling as well as regular telephone calls. 8×8 Inc. is a provider of cloud communications and customer engagement solutions. Services available include cloud –based voice, contact centre, video, mobile and unified communications for small, medium and enterprise businesses. The platform offers a unified communications system which is easy to use. It has many features including calling, collaboration, mobile apps and tools. 8×8 is a cloud-hosted VoIP (Voice over Internet Protocol) phone system. No complicated PBX hardware is needed. Phones can be purchased directly from 8×8. If you choose to do this, the will come preconfigured and ready to use upon arrival. However, if you purchased from an outside vendor, an 8×8 representative will help you during initial setup. The entire 8×8 system is setup and managed via online portal. From where users have access to billing, call logs and support. Administrators can also create and setup extensions and call groups. 8×8 offers three price plans. In order to subscribe, users will need to contact the sales team directly. All plans include unlimited calling, mobile apps, auto attendant, online call management and business SMS. Users have complained that the cost is high compared to other providers. RingCentral is a provider of cloud-based communications and collaboration solutions. It was founded in 1999. The solution includes all PBX administration functions, Android and iOS apps and unlimited calling. Upon registration, users will be assigned an ‘implementation specialist’ to help determine the number of phones you need. They also help to either transfer over or create new numbers for you. Any phones you purchase directly from RingCentral are preconfigured and ready to use upon receipt. RingCentral offer several pricing tiers for small businesses. These range from $19.99 for the ‘Essentials’ package to $49.99 for the ‘Ultimate’ package. All plans include unlimited phone calls, unlimited business SMS and mobile apps. They also offer unlimited video and audio meetings with screen sharing on both the desktop and mobile apps. However, the number of screen-sharing users is limited by the package you choose. For enterprise business, subscribers can request a demo and a quote by filling out a form on the website. Online commentators have noticed that it takes some time to get used to the interface. Vonage is an internet telephony service which provides business and residential telecommunication services. They were founded in 2001. Vonage Business provides users with video conferencing and online collaboration. The solution offers businesses access to a web-based console. Users can view extension numbers, the number porting tool and setup guide. Subscribers have access to a variety of plug-ins as well as services. Some plug-ins are free such as integration with Clio, ConnectWise, Google G Suite and Microsoft Dynamics. 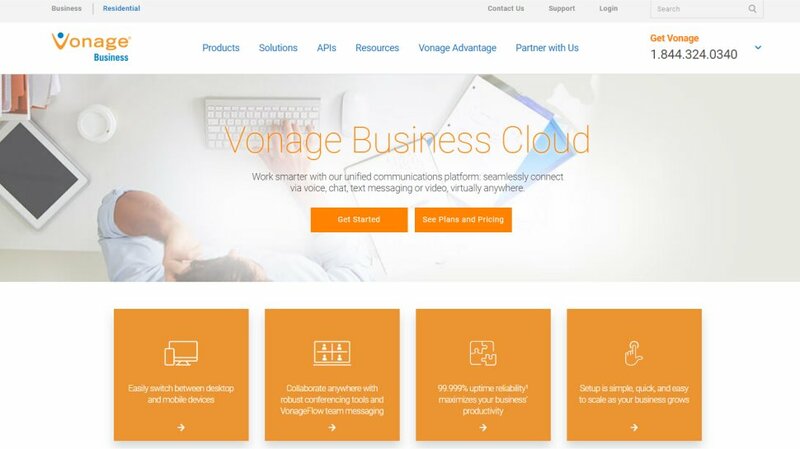 Vonage claim to have an easy to use service with no need to install complicated PBX hardware as everything is cloud-based. The ‘Mobile’ package starts at $19.99 which includes unlimited calling and messages, mobile app, desktop app and Vonage Flow Team messaging. The ‘Premium’ plan starts at $29.99 per month per user and comes with extras such as CRM integrations, multi-level auto attendant, conference calling, online meetings and video conferencing. The top tier plan available, weighs in at $39.99 per month with all the first two tiers have to offer plus on-demand call recording and Vonage Visual Voicemail. Vonage offer a 14-day free trial for all packages. Some users have claimed that calls can disconnect at times. 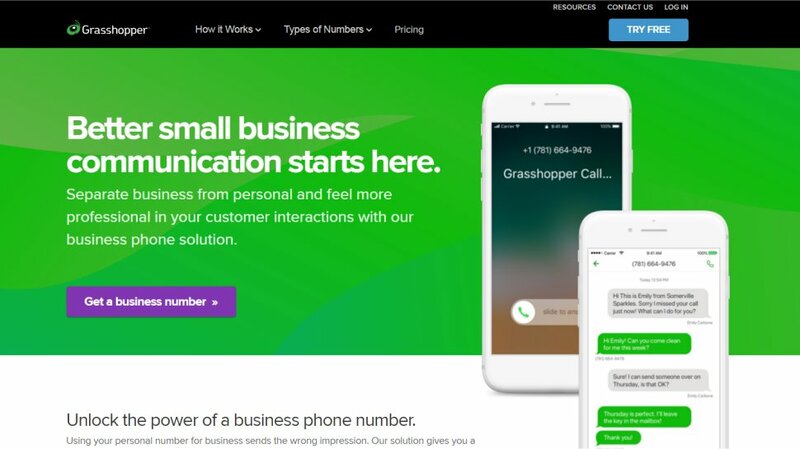 Grasshopper is a company that sells call forwarding and answering services to small businesses. The solution is attractive for small businesses as it needs no hardware and is easy to setup. It is a virtual phone system. All calls are answered by an automated phone assistant, which then forwards them to the relevant person or department. Users can create a unique vanity 800 number upon registration. Grasshopper integrates with Skype, LiveChat, Google Voice, Zapier and Bitium. Grasshopper has an app for both Android and iOS. Users will be able to receive calls through their business line from the app. The ‘Solo’ plan is $26 per month and includes 1 number and 3 extensions. The ‘Partner’ package is $44 monthly and includes 3 numbers and 6 extensions. The ‘Small Business’ plan is $80 per month. This includes 5 numbers with unlimited extensions. The ‘Small Business’ plan is $89 per month. This includes 5 numbers with unlimited extensions. All plans offer business texting, inbound fax, call forwarding, custom greetings, Wi-Fi calls, desktop, mobile apps and unlimited minutes. Some users have requested an outgoing fax feature. MegaPath is a business telecommunications provider. It was founded in 1996. The solution offers businesses internet connectivity, unified communications, security services and managed networking. Through their ‘Unified Communications’ product, MegaPath offers users combined phone, video calling, chat and online collaboration. Users can host voice and video conferences, share their desktops or start group IM’s. This can all be done using your business number from any device. For more information and customized quote, subscribers need to contact the sales team directly. Users can manage all features, such as conference calls and call routing, via the online portal. Support can also be accessed here. Voicemails are transcribed and accessed through email and faxes in PDF format. Hosted Cloud PBX package starts at $19.99 (£15.56) per month. This includes an automated attendant, audio conferencing, instant messaging, desktop, tablet and mobile apps. 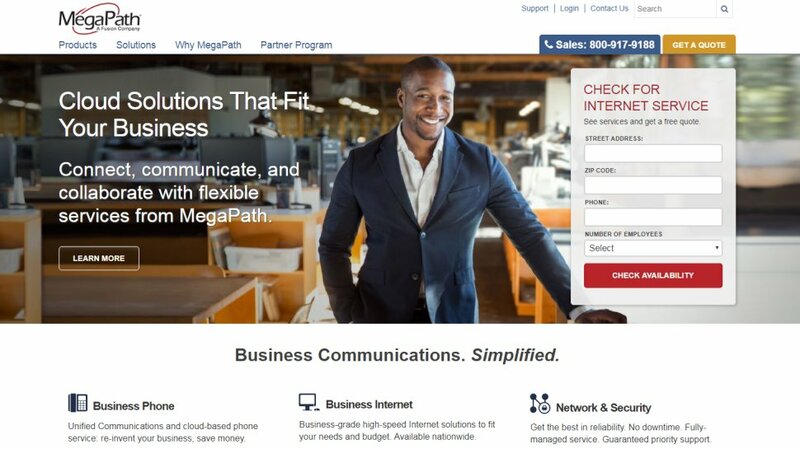 MegaPath offer a 15-day free trial for both PBX and Unified Communications. aircall is one of the more innovative cloud-based phone providers for business. Not only is it entirely cloud-based, making it an excellent choice for those with mobile devices, it also comes with a ton of standard features. Even better, it comes not just with analytics, but with a huge number of integrations, such as SalesForce, Zendesk, Zoho, Freshdesk, and Shopify. 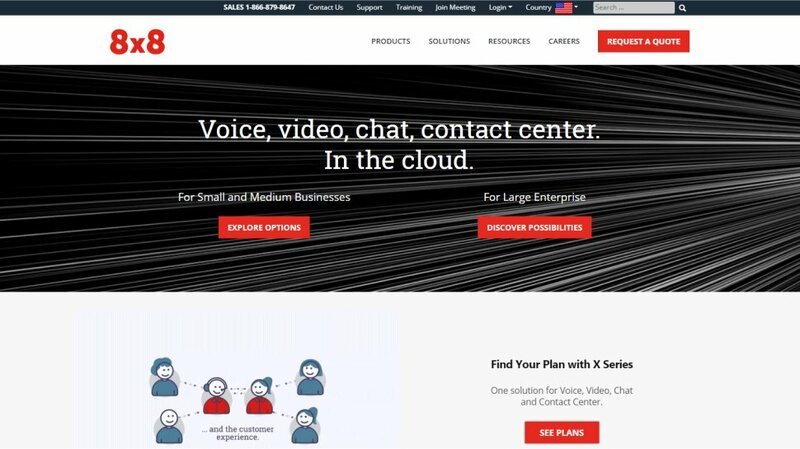 Jive is another company that offers a hosted cloud VoIP system which combines both voice and video, making it ideal for use on mobile devices such as cell phones. It also comes with a lot of standard features, including analytics, and of course video conferencing. Although it starts from $29.95 per user for up to 4 users, the cost-per-user decreases the more users you sign up. Dialpad is another big cloud-hosted PBX worth looking at. Dialpad runs using Google&apos;s Cloud, and as above includes both voice and video conferencing as standard. It also offers AI to work through your logs to offer actionable insights to help improve business efficiency, customer retention, and profitability. It&apos;s also cheap at $20 per user, though costs more to unlock more features. Microsoft Phone System is part of the Microsoft Teams stable, which not only offers cloud-hosting calling, conferencing, and chat, but also promises full integration with the Office 365 office software suite. However, if you don&apos;t want to move to the cloud you can use your existing PBX hardware. 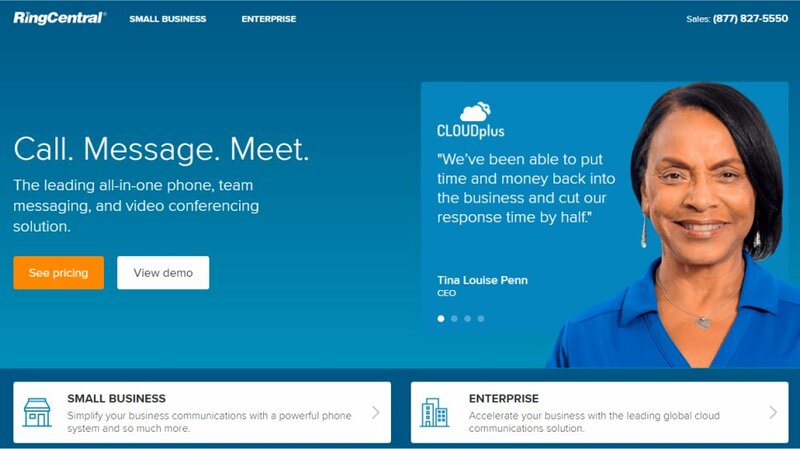 MiCloud Connect is the hosted PBX solution by one of the world&apos;s biggest specialist VoIP providers. Although it looks geared more to enterprise, it&apos;s also accessible to smaller business, with a range of scales available according to need. It also comes with CRM options and a host of other features to improve business operations.